In Malaysia they drive on the left side of the road, so the wheel is on the right side. It's a little bit frightening, when you have never driven on the left side. Specially when you see the traffic jam in Kuala Lumpur and George Town. Lucky for us is, that it's outside these city's very quiet on the road! In Malaysia you see beside the well known cars, also unknown cars: the Proton and the Perodua. These cars are favourite in Malaysia. They are built with a little help of Mitsubishi Motors. Specially the Proton has a large range of models:Saga, Wira, Perdana, Waja, Putra, Satra. When you rent a car, you get likely a Proton Wira. The latest car company in Malaysia is the Naza. 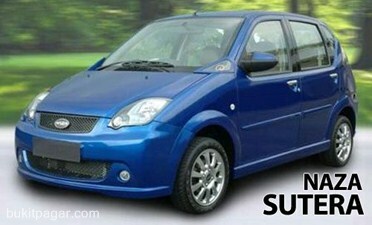 Their famous model at the moment is the Sutera. The Perodua is a sort of sister company of the Proton. it's specialized in jeeps (Kembara), little cars (Kancil) and in vans (Rusa). To drive in Malaysia you need a valid driving license with a photo or an International Driving Permit. One of these will be sufficient. "Two years ago I had my valid driving license with me. I rented the car for a whole week. My first day I made a trip from Kuala Lumpur to Kuantan (East Coast). I was driving behind a lorry and suddenly appeared a big whole in the road I couldn't avoid it: a tyre-burst followed and I heard a strange noise at the back wheel. I thought it would be wise to contact the rental Company in Kuala Lumpur. So I took all the papers and walked for 2 miles to a public phone. I told the company what happened and they advised me to change cars in Kuantan. I thought it was a good idea. I went back to my car and changed the tyre. And with that strange noise I drove to Kuantan. ten kilometres before Kuantan the car broke down totally. I stopped a taxi, took our suitcases with me and the taxi driver took us to our contact in Kuantan. My contact was not impressed at all. "Where did you leave the car exactly?" (the taxi driver helped me, thanks!) and "Here's another car!" Everything perfect arranged and quickly done! Only..............that evening......in my hotel.......I missed my valid driving license!!! I think I left it behind at that public telephone. Somewhere between Kuala Lumpur and Kuantan! The rest of the week I drove through Malaysia without my driving license. I passed police-controls (they saw on the plate, that it was a rental car) and I even asked the way at a policeman. No problem at all; very exciting! Back home in Holland I got a new driving license within an hour. They thought I lost my driving license in the jungle. Lesson: Take an International Driving License. Now it was easy, but the next time................."
From the Thai border to Johor Bahru (near Singapore) is the Expressway (850 km) It's a quiet road. The speed limit on the highway is 110 km/hour, but on some parts it may be 90 km/hour. It's toll-road, but for a few dollars you can easily drive a few hundreds kilometres. There is always a speed control by the police. The toll price depends on the distance and the type of car. Rest stops along the highway provide facilities such as food outlets, petrol stations, phones, children's playground and toilets. There selling leaded, unleaded and diesel petrol. Thank you very much for your enquiry pertaining our rental service. We are pleased to offer 30% discount on rentals booked through email. Rate quoted above is inclusive of unlimited mileage 2 weeks usage, 5% Government Service Tax, *Collision Damage Waiver, servicing and maintenance except fuel. All Kasina vehicles are rented out with full tank of fuel and shall be returned with similar full tank, otherwise refuelling service will be provided at your expense. Should you have any further enquiry, please do not hesitate to contact us, or kindly log on to our website at www.kasina.com.my Should you find the offered model does not meet your requirements, please make your choice and advise us of your preferred model. We trust the above quoted rate is satisfactory and shall be pleased to hear favourable answer from you. You can be assured of our prompt and careful attention.